I had the opportunity to do some drum recordings with the DMK1 , a three-mic solution for drum recording made by the Latvian company JZ Microphones. Being half Latvian myself, I was excited about doing this review! The DMK1 consists of three JZ BT201 small diaphragm condenser microphones: A matched pair with wide-cardioid capsules for overheads, and a single mic with -20dB wide-cardioid capsule for kick drum. This package also included a carrying case and mic clips. The microphones felt solid and well built, and I especially liked the custom XLR connector housing. A great touch. My experience with ‘simplified’ mic setups is that they are always contingent on a getting a particular ‘sound’ captured and committing to it. Some people might call this an ‘old school’ approach. It does, however, demand critical mic placement, longer setup times, and a philosophy of commitment that is rare in our DAW-based worlds. 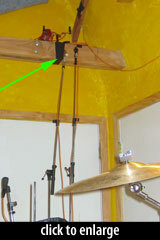 Most people record with an abundance of drum mics, and then create/debate a ‘sound’ later in the mixing stage. We experimented with the three mics as a room and kick set-up as well as an overhead and kick set–up. In both cases the personality of the drums came through quite well. The sound was open and clear, but not overbearing. By this I mean the lack of a big low–mid frequency bump made the drums seem spacious. 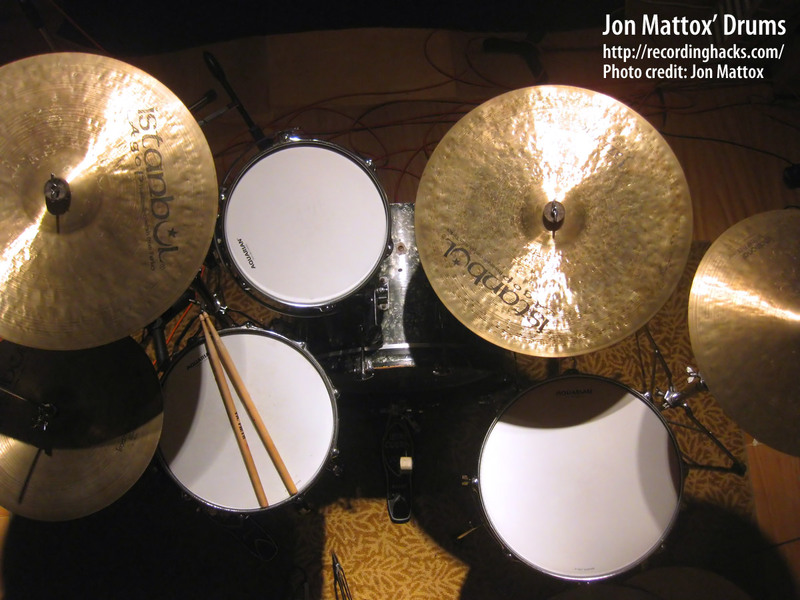 The attack on cymbals as well as snare and toms was very present with good clarity, and the kick had the same quality. This mic system doesn’t feel like a rock sound. It seems more suited to Jazz or Fusion, lighter in feel, not bombastic. We wished there was more time to experiment with various mic placement techniques as that’s the true test of how good a drum kit can sound in a room, but we were pleased with the results we obtained. I know I would welcome more time to just play with the possibilities of more radical miking techniques. To add to what Matt said, for a modern rock drum sound you would want to compliment the DMK1 with close mics on the toms and snare to create more definition and tone out of the drums. Right out of the box, and without any eq and compression, the DMK1 setup created a pleasant sound that was ready to be mixed into a song’s production. 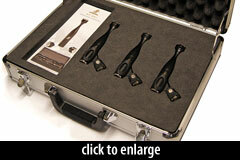 It is indeed a great solution for certain types of recording, but not as a ‘one size fits all’ type of sound. I think the best applications for the DMK1 would be for recording drum tracks with a lighter based feel as well as drum tracks that needed a more ambient quality. 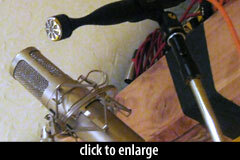 Audio samples of our DMK1 recordings can be found in the mic shootout below; see tests #3, #4, and #5. Matt and I were so impressed by the BT201s as overheads, that we decided to do a mic shootout against some mics that we typically use. The C1s have a definite character sound to them and would need a bit of eq carving to fit into a mix. The BT-201s on the other hand have dramatically brighter sound which makes all of the drum transients stand out sharply with more punch. Adding some compression to taste would help compliment a close mic’d drum set to sound bigger and more full. As a quick experiment (I love tweaking mic placements), we reversed the direction of the mic capsules 180 degrees from the kit, pointing at the walls of the room. 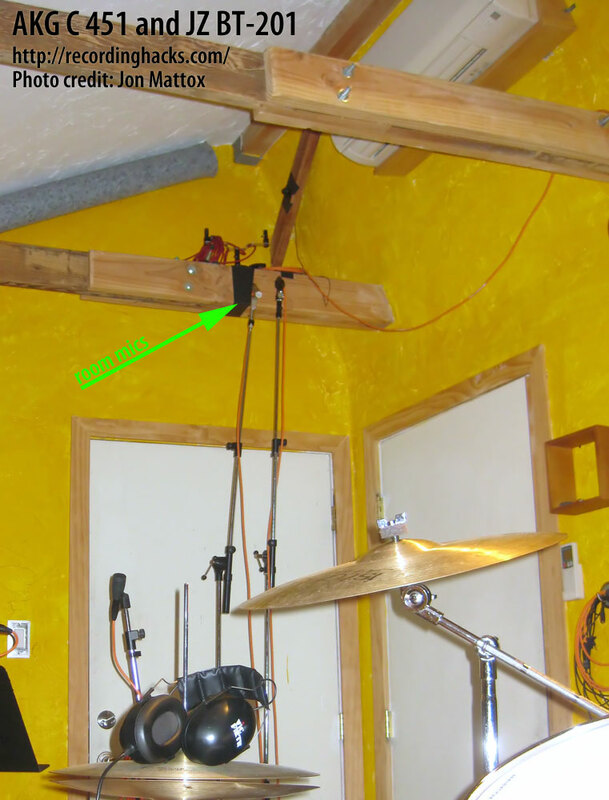 This diffused the drum transients, but created a different kind of room sound. The stereo balance is a bit skewed because of the wall angles, but I like the BT-201s here a lot as they reveal more cymbal definition than the C1s. The 451s have that balanced ‘classic’ sound to them which is warm and pleasant. The BT-201s have a noticeable high end bump which again brings out more of the cymbals and adds attack to the drum transients without sounding brittle or harsh. I imagine that this sound would work well for jazz, pop, fusion, and modern rock. The AKG 451 is one of the standards used for overheads, and I use these all the time for that ‘classic’ well balanced sound. 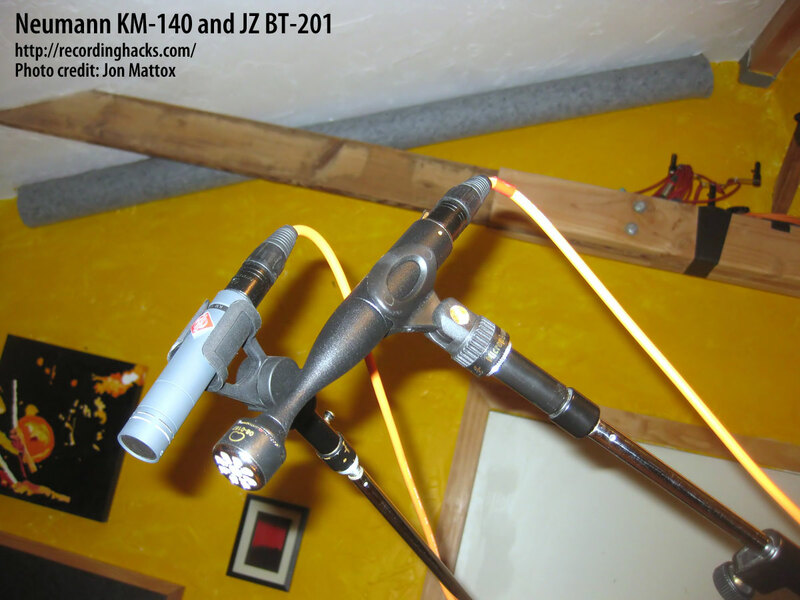 However, the JZ mics do something special here compared to the 451s, and this is where the BT-201s shine! 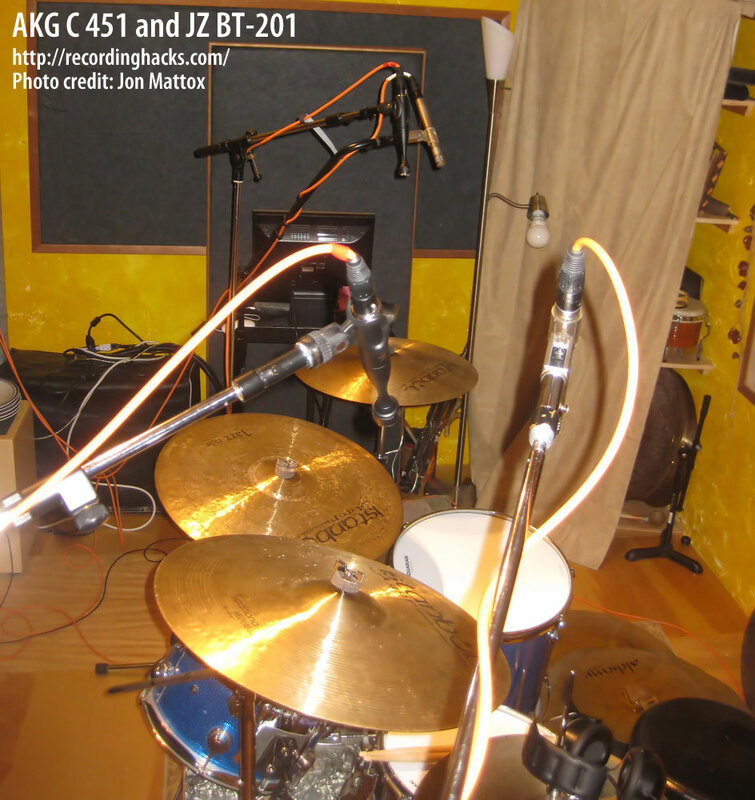 The JZ mics make the cymbals speak more clearly, and with more definition. The extra high end makes them more open sounding and as if they are already eq’d and are ready to get mixed into the music. They are a different flavor of sound, and I like this a lot. To me the JZ mics wins hands down. The AKG 460s are a good sound but would need eq to help cut through a mix. Compared to the BT-201s on drums, they sound a bit dull. Not much else to say! Sorry 460s, we even forgot to take a picture! Like the AKG 451s test, this is a real ‘apples vs. oranges’ result for me. The Neumanns have a more full and rounded sound, especially in mid/lower mid frequencies, most noticeably on the drums themselves. The JZ mics have a much different timbre, but equally good. 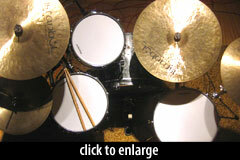 Again, cymbal definition is good and clear on the JZ mics, and as-is they would work well for many styles of music. 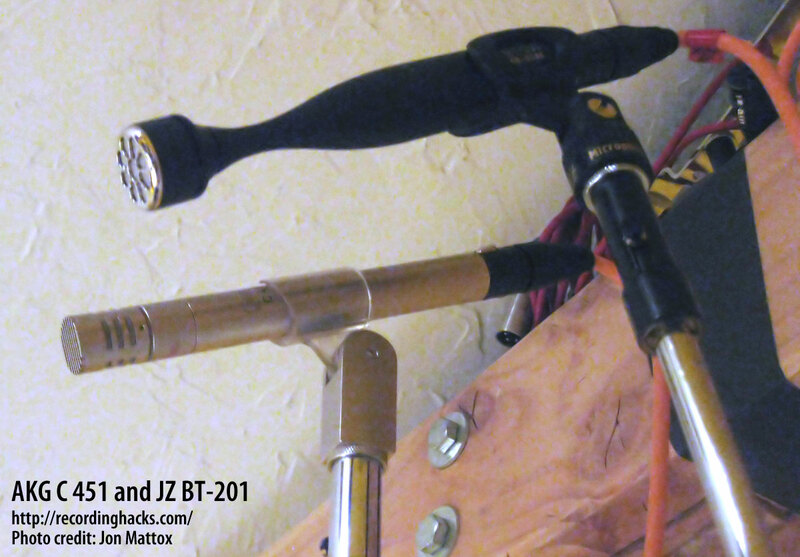 Based on these drum recordings, the JZ BT-201s condenser mic from Latvia has a clean, pleasant, and open sound. Right out of the box, and without any EQ or compression, it sounds ready-to-mix. It has a signature sound with a pleasant high-end boost that on cymbals reveals lots of clarity and detail without sounding brittle or harsh. There’s a lot of value packed inside this mid priced mic, and it would be a welcome addition to any mic collection. The BT201’s appearance is somewhat surprising. 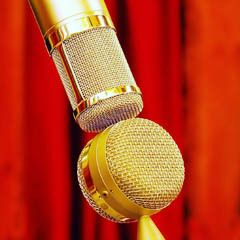 The body of the mic narrows to a very small diameter just after the capsule, then widens out to the size that the capsule occupies, reminding me of a stretched old Coca-Cola glass bottle. But that’s the last thing that found odd about the mics. We put them up against a budget condenser and two well-known condensers with well-respected pedigrees. 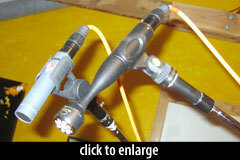 The BT-201 performed very well against the bigger-name mics on drums in overhead and room mic applications. The most noticeable thing I found was the sound. The response curve in the literature showed a rising high end and a subtle roll-off in the low frequencies. This is the same response curve I usually build into the overhead mics on a drum kit [via EQ], and it works here. The cymbals came through with clarity, but not harshness. The low end got out of the way, but didn’t totally disappear. The sound enhanced the attack of the drums and added clarity to the kit. We also tested a JZ BT-201 with a -20 db pad [built into the wide-cardioid capsule]. 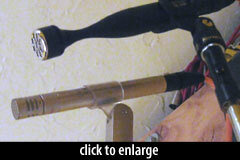 We placed it in front of the kick drum with no front head, about 2½ ft. away from the front rim. Again the drum was clear, not harsh, but had a strong attack and smooth bottom. Personally, I probably would add a bit of low EQ for a rounder sound that’s more suited to my taste. The sound of the kit with just the three mics had an open, present sound, that reminded me of a jazz type feel. In comparison, the AKG 451 and Neumann KM 140 pairs had a fuller sound, with more meat in the mids and lower mids. If I were looking for a more traditional full sound with just two mics, these would work fine, but I would want to EQ them to my taste. The JZ mics have a sound right out of the box, and it’s a good sound. If combined with close miking, they would be great overheads with very little work to get a good balance. 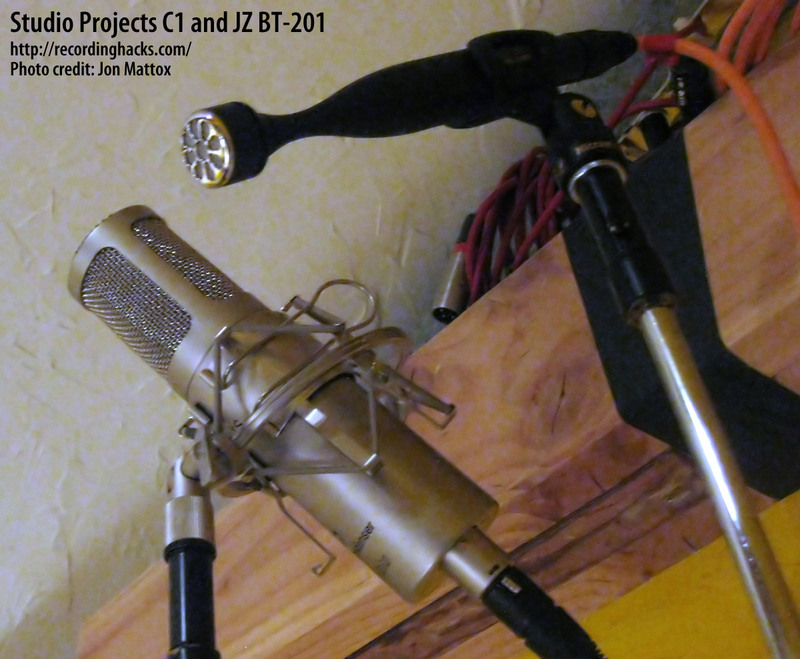 The Studio Projects C1 mics performed adequately, but didn’t have quite the refined smoothness of the AKG and Neumann, or the openness or transient response of the other mics. So if there’s budget for a pair of good overhead mics, the BT201s will definitely fit the bill. I can imagine that they would work well on other instruments that benefit from a high frequency presence boost — acoustic guitar, strings, and percussion come to mind. If you’re looking to fatten up a sound these won’t be for you, but to open the top end in a smooth pleasing fashion, these do work well. all drums wide open tuning with no muffling, tape, etc. 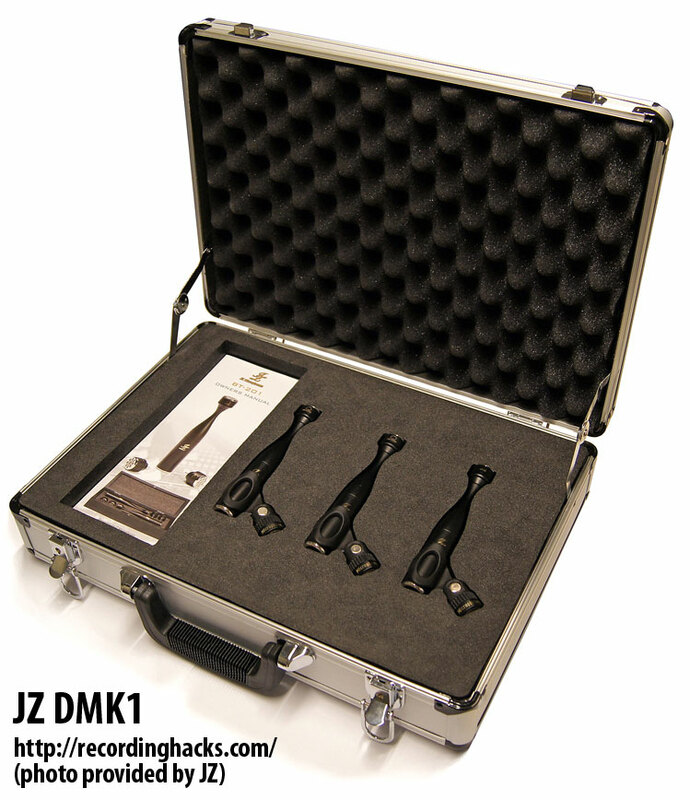 Special thanks to Edijs Rudzis of JZ Microphones for sending what I believe was the very first DMK1 kit in the US. There’s no question Jon and Matt enjoyed playing with it, and I believe they’re planning to do more tests on other sources — stay tuned! Huge thanks also to Jon Mattox and Matt Forger for the extensive testing and review! 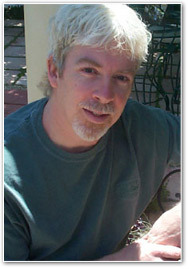 What do you think of Jon’s audio clips? Did you hear how the inclusion of the 3rd mic brought out the low-end impact of the snare and toms? We welcome all comments. Drummers, for more OH comparisons be sure to check out our small/medium/large mic comparison, in which the Oktava MK-012 is up against the CAD M179 and Avenson STO-2 in yet another overhead mic shootout. For insight into the differences between XY, spaced pair, ORTF, mid-side, and “recorderman” overhead mic positions, listen to the audio files in our overhead mic position comparison. Dude! Great post. I’m working on an album, which is being self produced by the band and engineered by its founding member. He’s going to love this post and your site. As a performing drummer and aspiring recording engineer, I’ll have to start referencing it more often myself. Standing out JZ’s 201, like an alternative to nonetheless ‘brilliant’ KM 184. 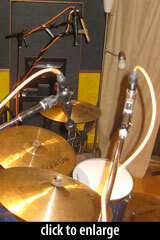 @ Robonzo & everyone : take care of you, cymbals are powerful DURING tracking & also AFTER, while mixing. Hail Europe, long live the “Balts”.